as I embrace new possibilities. I have a private blog here on blogger. It used to be open to the public but as I got more and more prolific here on Confessions, I decided to close it. If you think I get personal on this site, boy, oh boy! It's NOTHING compared to the thoughts and stories I shared over there. It's super personal and even though I wrote using a "handle," (I didn't have that profile linked to my main profile which in turn means that it wasn't linked to this site and my real name), I was still afraid of it lessening the brand I'm creating here. I used that blog as a depositary for all the fears associated with health concerns, all the rawness of a broken heart, all the disappointment for a life I felt was slipping through my fingers. My thought was that if I could spew all that "junk" out over there, then it wouldn't eat the real me alive. It worked for a while. I had several loyal readers from around the world who commented frequently. But the more personal I got, the more afraid I started to become that I was baring too much, making myself too vulnerable and I feared the real or imagined consequences of someone finding out who I was in real life and thinking me incapable of being sane and living a balanced life. So I closed it. I have I think 4 people who I invited to the closed blog so that they could read my inner ramblings, know me from a different point of view. Two of them are family members, 2 of them friends. I haven't written anything over there since 2009. But I do occasionally pop on over there and read back over some of the things I wrote. Some of the words surprise me. Some make me long to feel that kind of passion again. Mostly I see patterns, I see growth, I see an emotional life that was cyclical and honest. And above all, I see strength. Strength that allowed me to feel all that pain I felt back then over failed relationships, the fear I felt through a couple of potential cancer scares, the uncertainty of a career spinning out of control. I survived it all … winding up stronger than I was going in. Isn't that what we all want? To know that whatever trouble we're facing, whatever obstacle life places before us, that we will not only survive it, but that it will make us stronger, perhaps even better somehow by teaching us something we needed to know? Easter is almost here and my thoughts have been filled with a sense of renewal and my own personal rebirth of sorts. A year ago, I wouldn't have thought that I would feel this way again. I faced so many obstacles that I often felt overwhelmed. My parents have taught me much about overcoming obstacles. They have both had so much thrown in their path and yet they keep going. I have heard "Whatever doesn't break you, makes you stronger" and "This too shall pass" and "One day at a time" and "God's will be done" my entire life. These sayings aren't just words to me. They have spurred me on when I thought I could no longer put one foot in front of the other. Because, no matter how hard it might seem sometimes, the only way to live is forward. 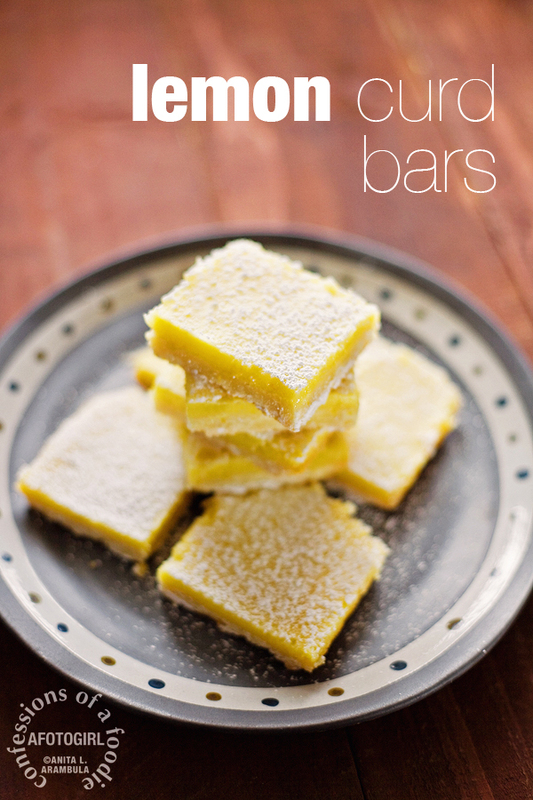 Let me start off by saying I have always had a strong dislike for lemon bars. To be fair, I've only ever had them in cafeterias. And they just didn't do anything for me. A few weeks ago, I made and posted a recipe for homemade lemon curd. As I stated then, the homemade variety made me a lemon curd fan. Something I thought I would never hear myself say. But now I had a jar of lemon curd in my fridge and needed to make something with it. I love shortbread. 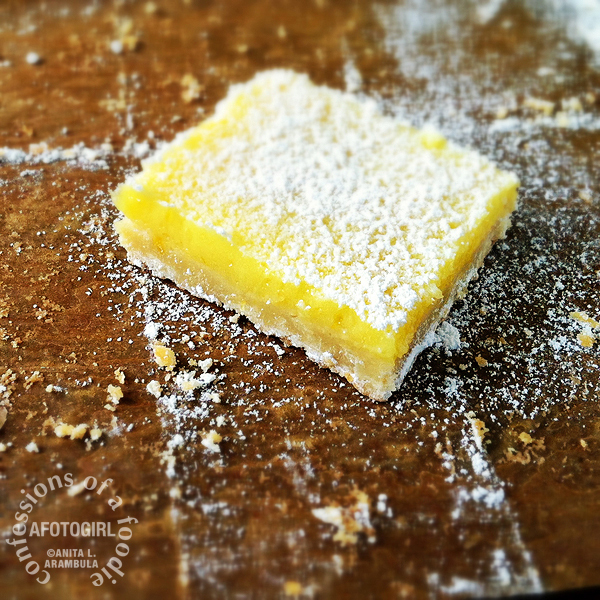 And I thought, well, if the homemade curd turned me into a lover of it's lemony tartness, what might a homemade lemon curd bar do for my previous dislike of the dessert? And it got me thinking about all sorts of lovely things like lime curd. Orange curd. Tangerine curd. Seriously. The wheels are turning. Pies. Tarts. Bars, bars, bars. I took half of these to work, cut up into small bite-sized pieces and they were very much enjoyed. One photographer even commented that he was not a lemon bar fan but my bars converted him. Preheat oven to 325 degrees (300 degrees if you are using a glass pan). Butter an 8 inches x 8 inches square metal pan. Cut a piece of parchment 8 inches x16 inches and place into the pan, centering the overflow. These will be the "handles" to lift out the squares after they are baked. Smooth out the parchment and butter the bottom and side of the parchment (you can also use baking spray if you prefer). Using a mixer or a wooden spoon, cream the butter with the sugars in a medium bowl. Add the flour and combine well. Dough will be crumbly. Turn the dough out into the baking pan and use your fingers to evenly spread and press down the dough. Use a fork to poke several holes into the dough. Bake for 15 minutes. Lower the oven temperature to 300 degrees. Pour the lemon curd over the shortbread evenly. Return the pan to the oven and bake an additional 10 minutes. The baking without stirring will cause the yolks to rebond which will make it easier to cut the bars once they are cooled. 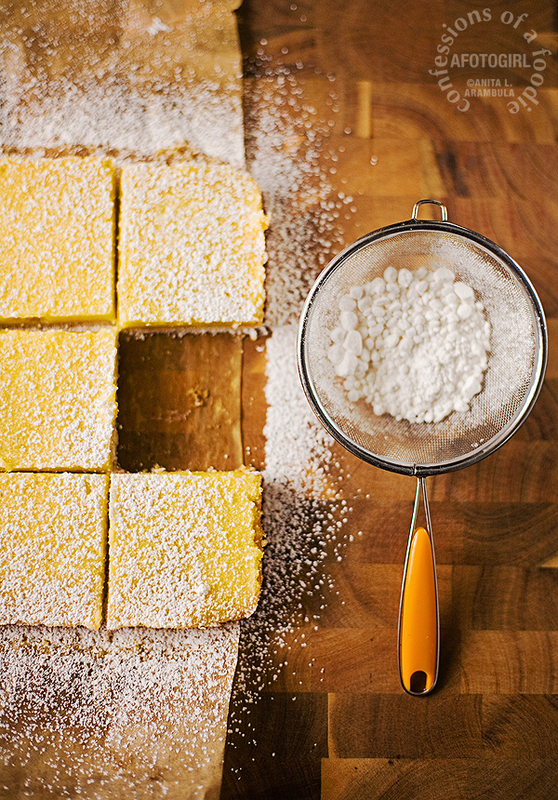 When the lemon bars have finished baking, place the pan on a wire rack for 10 minutes. Then run a rubber spatula along the non-parchment sides of the pan to loosen the cookie from the pan. Carefully lift the cookie from the pan and place on the cooling rack. 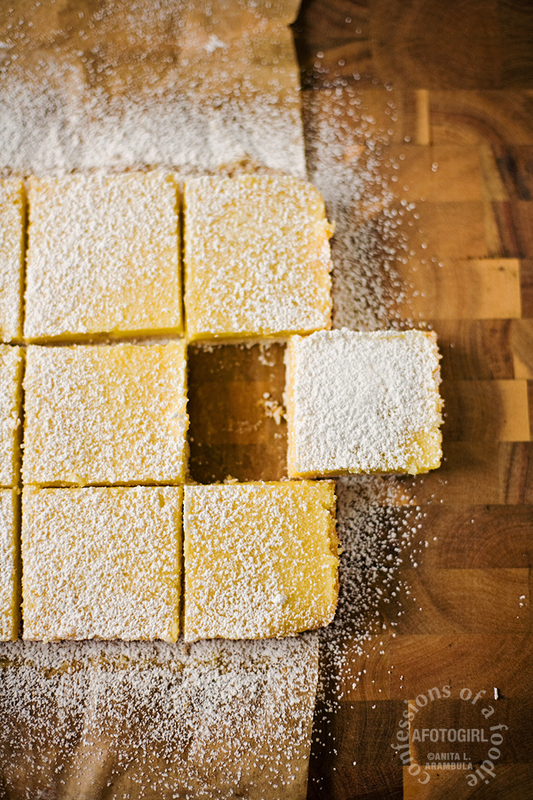 Once the cooking is completely cooled, sprinkle with powdered sugar then use a sharp knife to cut the bars into 9 squares. 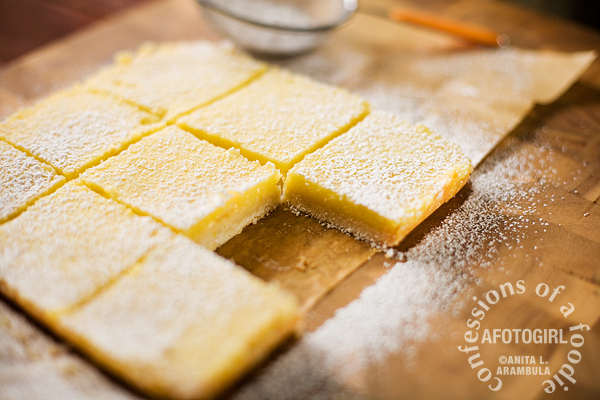 The lemon bars can be stored in an airtight container at room temperature for up to three days or in the refrigerator for up to a week. Though I doubt they'll las that long! If you are celebrating Passover, happy holiday. If like me, you'll be celebrating Easter, Happy Easter.